The Wouxun KG-D901 DMR Digital Portable Two Way Radio - This is the first digital radio from Wouxun and operates on 400-470MHz UHF frequencies at uyp to 5 watts. It lets you switch from analog to digital with one press of a button. The D901 is compatible with MOTO TRBO series Tier I and II using standard encryption. BuyTwoWayRadios.com announces they have the Wouxun DMR KG-D901 available in limited quantities for $149.99 (free shipping). See previous coverage here. Hams have a good option in the TYT MD-380, but I'm excited to see the comparisons with the Wouxun KG-D901. 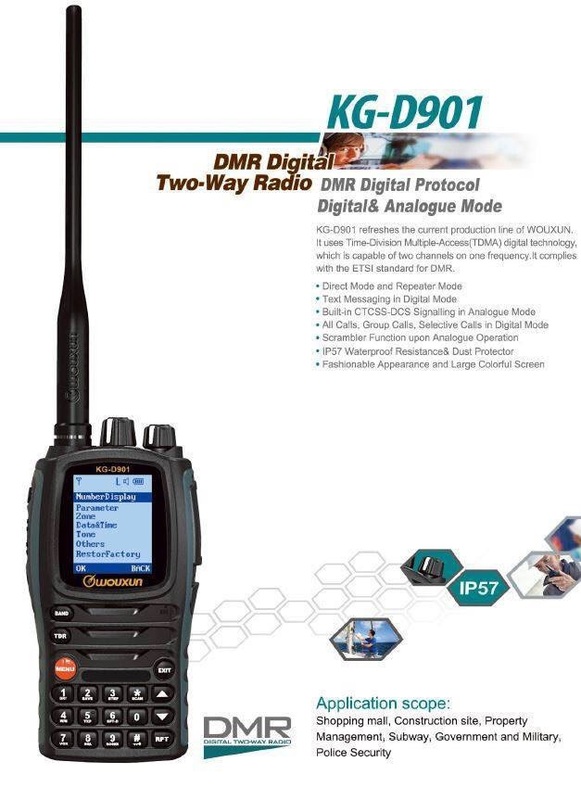 If you are already in the Wouxun ecosystem, this may be an easy choice for you since the KG-D901 shares accessories with radios like the KG-UV9D. "At first glance, The KG-D901 looks almost identical to the analog KG-UV9D and KG-UV9D Plus multi-banders, with the large, color LCD display first introduced in popular KG-UV8D and now considered a standard fixture in the latest generation of Wouxun portable handheld transceivers. It has the same keypad layout found on both the 8D and 9D models and the same array of buttons on the side. It has the volume and channel knobs, TX/RX LEDs and flashlight typically found on the other Wouxun radios as well. "The KG-D901 package includes one KG-D901 single band UHF or VHF two way radio (depending on your version of choice), a 7.4v, 2000mAh battery pack, belt clip, antenna, desktop charger, AC power cord, and wrist strap. The demo models we received did not include a manual, but we expect one to be in the box when the final version of the radio ships from Wouxun. The Wouxun KG-D901 is expected to arrive early summer 2016." Wouxun says the KG-D901 will be released next year. They also say there will be a KG-D900 - it will not have a keypad like the D901. So, it is real, but no firm date for it to be in someone's hands. Is it real? Will it be real? I had seen the image before. The BuyTwoWayRadios guys discuss what we know - which is basically only what you can see in the picture below. Wouxun won't confirm or deny the existence of the DMR radio.